Beethoven was a German composer and pianist. He created a vast output of music including nine symphonies such as the Eroica Symphony, the Pastoral Symphony and the great choral Ninth Symphony. He also wrote much piano music such as the Pathétique, the Pastoral, the Moonlight, the Waldstein, and the Appassionata sonatas, and violin music such his the Violin Sonata No. 9 (the Kreutzer). 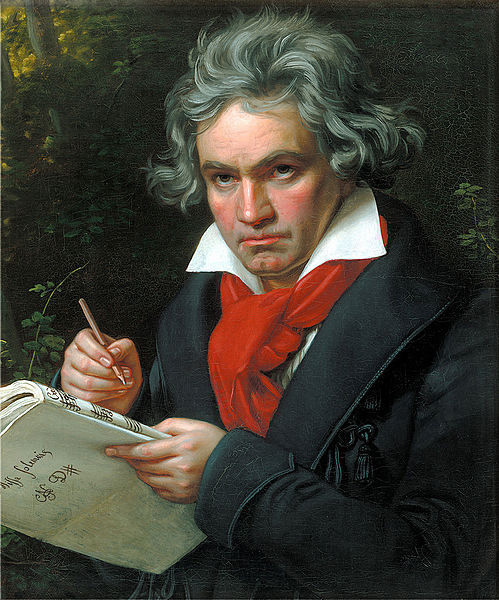 Portrait of Ludwig van Beethoven working on the score of Missa Solemnis in 1820. Beethoven at the age of 49 (at this time he was already completely deaf). This portrait was painted by Joseph Karl Stieler (1781-1858). It is currently on display in the Beethovenhaus (Beethoven House), Bonn, Germany. 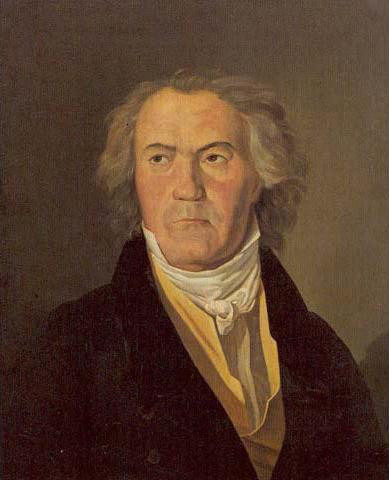 Portrait of Ludwig van Beethoven (1803). This painting was done on ivory by the artist,Christian Horneman (1765-1844). It is on display in the Beethovenhaus (Beethoven House), Bonn, Germany. 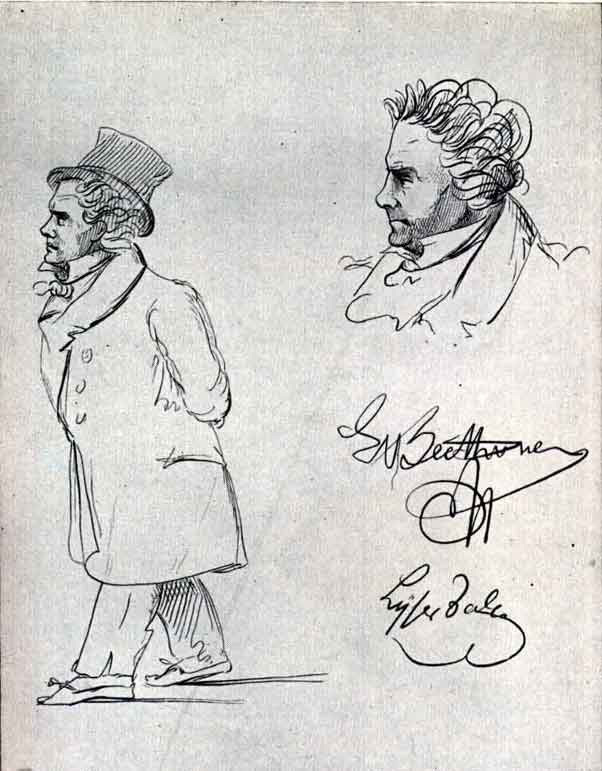 Caricatures of Ludwig van Beethoven (1815). These pencil sketches show Beethoven walking the streets of Vienna deep in thought and with not a great deal of attention to his appearance. The signatures of Beethoven and of the artist -- Johann Peter Theodor Lyser (1803-70) -- are included on this artwork. 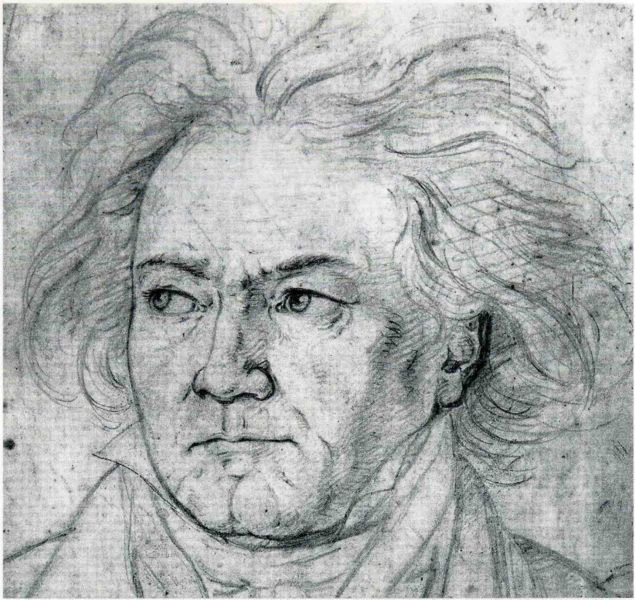 Sketch of Beethoven in 1818. August Klöber). The current location of this sketch is the Beethovenhaus, Bonn, Germany. Beethoven composing in his Vienna apartment in the latter part of his life.There are books and papers on the top of the piano and under it! This was a popular 19th century print (it was often called "Beethoven Composing in his Study") and was based on a painting (circa 1890) by Carl Schloesser (1832-1914). 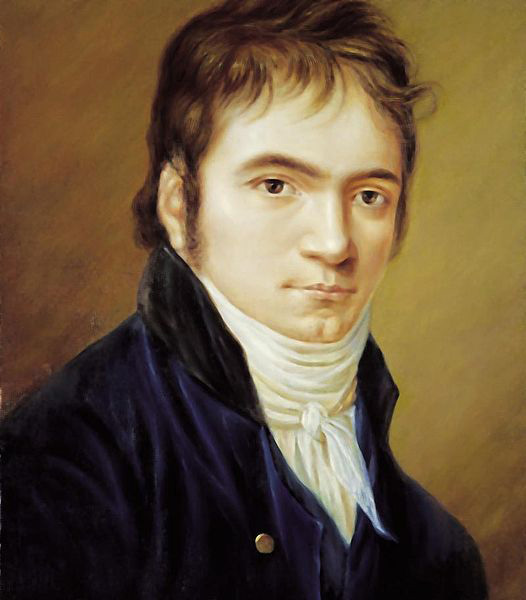 Portrait of Ludwig van Beethoven in 1823. This picture was painted by Ferdinand Georg Waldmüller (1793-1865). Beethoven tried all sorts of cures for his deafness. 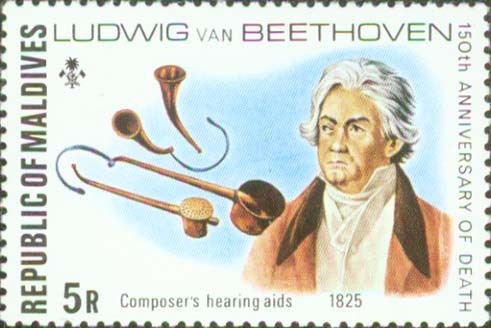 Here are some of Beethoven's hearing aids (including his hearing trumpets), as depicted on this postage stamp issued by the Maldives in 1977. In 1802 Beethoven lived and worked in this house in the small town of Wien-Heiligenstadt on the outskirts of Vienna while he was trying to come to terms with his growing deafness. 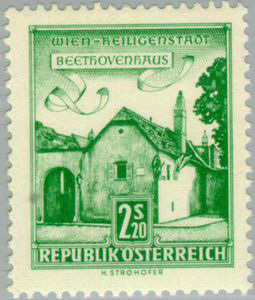 This stamp was issued by Austria in 1962. Beethoven and his Third Symphony (also known as the "Eroica Symphony"). It is believed that this symphony was written in praise of Napoleon and the liberation that he initially brought to the peoples of Europe (see the wreathed drawing of Napoleon and the broken chains). However, Beethoven is said to have torn out the title page of the "Eroica" when he learned that Napoleon had crowned himself emperor. This stamp was issued by Senegal in 1970 to celebrate the 200th anniversary of Beethoven's birth. 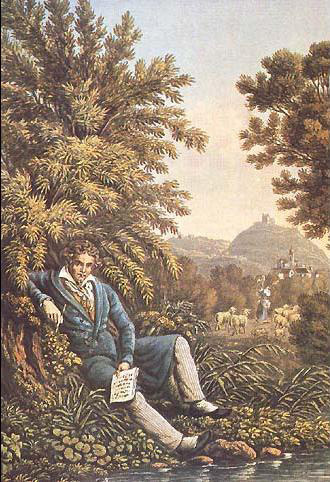 Beethoven composing the Sixth Symphony (also known as the "Pastoral Symphony"). This lithography appeared in an issue of the the Swiss musical journal, Almanach der Musikgesellschaft, that was published in Zurich in 1834. A copy of this lithography can be seen in the Beethoven Haus, Bonn, Germany. 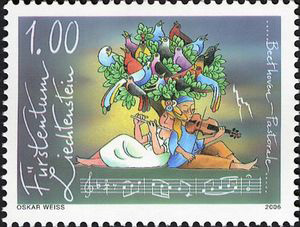 Several bars of the "Pastoral Symphony" (along with a cartoon of musicians playing their instruments in a rural setting) are here depicted on a stamp issued by Liechtenstein in 2006. 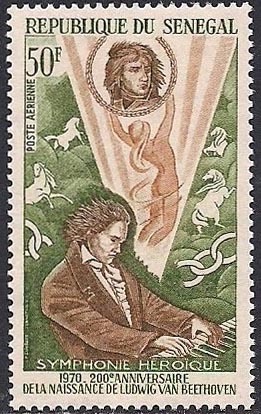 Beethoven's Egmont Overture is featured on this stamp issued by Belgium in 1990. On the left is the Duke of Egmont and on the right is Beethoven. 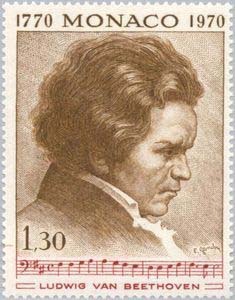 Ludwig van Beethoven and one of his great musical works appear on this stamp issued by Monaco in 1970. 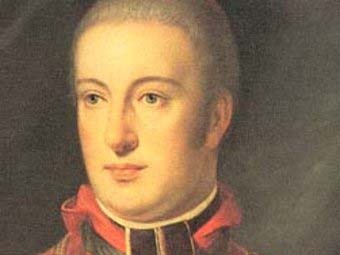 Detail of a painting of Beethoven's patron, Archduke Rudolph (Rudolf von Habsburg-Lothringen). The full title of this painting is Portrait of Rudolf Johannes Joseph Rainier von Habsburg-Lothringen, Archduke and Prince Imperial of Austria, Prince Royal of Hungary and Bohemia, and it was painted by Johann Baptist Lampi (1751-1830). 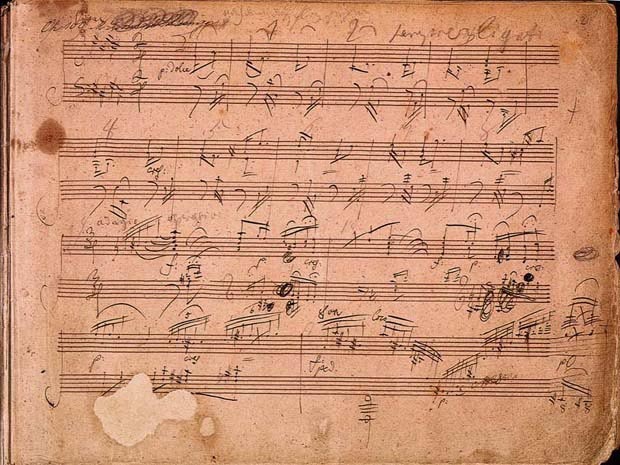 A page from the original manuscript of Beethoven's Missa Solemnis. Autograph (manuscript written in the composer's own hand) of the first page of the first movement (Vivace, ma non troppo - Lively, but not too much) of Beethovens Piano Sonata No. 30 Op. 109, composed in 1820. 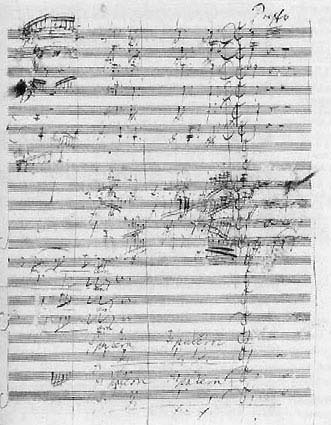 A page from the original manuscript of Beethoven's Ninth Symphony, (also known as the "Choral Symphony"), fourth movement. Beethoven's Ninth Symphony op. 125 (also known as the "Choral Symphony") appears on this 1959 German philatelic mini-sheet which marked the opening of the newly built Beethoven-Halle in Bonn, Germany. 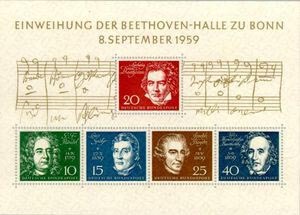 Also included as part of this mini-sheet are four postage stamps that depict respectively the composers Beethoven, Handel, ____, Haydn and Mendelssohn. Beethoven's Ninth Symphony is also depicted on this stamp issued by Mexico in 1970 to celebrate the 200th anniversary of the year of birth of the composer. Interestingly, both the 1959 German and the 1970 Mexican stamps (shown above) use the same image (an excerpt of the Ninth Symphony written in Beethoven's own hand). This image was first published in Anton Schindler's 1840 biography of Beethoven. Note: This picture gallery page includes drawings, paintings, photos and images of Ludwig Van Beethoven, his music, activities, friends and family, and the various places where the composer lived and wrote.